Much like everyone else, the Humboldt Bronco tragedy has weighed heavy on my mind. I have been collecting my thoughts here as I work through this tragedy in my own way. It has been an emotional process as it has evolved. How does the entire thing resonate with me? I am able to either see or relate my life – personally or someone I know and love – in some way to all the faces, names, stories and lives involved. It has created a web of emotion which I am struggling to escape from…it all stings in my heart for so many reasons! Breaking hockey’s most basic rule. It seems that every one of us have moved through the past few days breaking one of the games most basic rules. From an early age we are told to skate with our head up…but this weekend…we all skated through life with our heads down. Who could blame us? The news was simply too tragic for any of us to honestly comprehend. Today nobody worried about getting hit when they had their head down. Today we were all bigger than the game. Today when we spotted someone with their head down, we did the second most Canadian-thing I know…we immediately lined them up, kept our elbows down, dipped our shoulder and delivered a HUGE hug – both literally and figuratively of course. A road trip down memory lane. I have spent the past few days connecting with people and stories I hadn’t reflected upon in years. It warmed my heart in some small way to stroll down memory lane; I spent many hours growing up with my hockey family on the bus. Today my mind took me places I hadn’t been in years and for a while I felt young again. I also forgot about political discussions, immigration debates and petty indifference…in an odd way it felt good to throw a hug rather than hit didn’t it? I will never forget Saturday and Sunday…they will forever live in my mind among those rare strange days in your life when time honestly felt like it briefly stood still. You looked around at others and strangely without saying a word, you knew exactly what was on their mind. Busses were a love hate thing at times…however in reflection, much of my career today was influenced not only by hockey, but by my time on the bus. What was a hockey player to do for off-season training in my day? Golf of course!!!! It was all the off-season cardio and strength training we ever did as kids. Yes…I practiced and taught myself sleight of hand magic as a way to pass time on the long bus rides as a kid. I really now see that the people and lives on that bus yesterday were just that…people and lives; not hockey players. You don’t officially become a player until you arrive at the rink; who you are and what you do are not the same thing. These were all people with stories and lives beyond the rink. Sadly, unlike me and my hockey family, many of them no longer have the opportunity to reflect and share their stories. This has made me look at life and people around me a little different today. Today I saw the person behind the cashier, the spirit beyond my children’s eyes and the warmth of my wife’s love in a way I hadn’t for a while. A team bus is a classroom on wheels…we gain lessons and wisdom we could never have gathered in any other setting. Being on the bus with your hockey family always felt like a little bubble of safety both physically and emotionally. When you board for a road trip, ALL your fears, anxiety and stress leave. You are with your “brothers” away from the stress of life and competition, just playing cards, laughing, watching movies, telling stories and making memories…or in my case, learning to perform sleight of hand magic at the card table preparing for what would eventually become my career. Honoring those involved; directly and indirectly. Although Sunday nights candle light vigil was tough to process, it was therapeutic in its own way. It brought our community together to collectively grieve, reflect and process the tragic events of the weekend. I now make my living behind a microphone and most days behind the podium blend into one another…not this one though; it will forever stand alone in my mind. This one served a purpose far greater than anything I have ever been involved in. It was a chance to be a part of the healing process for so many…myself and my family included. The vigil felt so right for all the wrong reasons. This Christmas I bought my 10yr old son a book for us to share and read together at bedtime. It was “Nine Lessons I Learned from My Father” By Murray Howe – Gordie’s son. He and I struggled to find the right time to begin reading it and it sort of sat in his nightstand drawer collecting dust. Somehow the book just organically found its way into our hands when we got home from the vigil…the emotional experience brought us together as a hockey father and son in a way nothing else could have. In my heart I believe it was Bronco’s goalie Parker Tobin who put that book in our hands that night…my son is a goalie and the goalie world is like a family within a family. I felt connected to Parker even though I never had the pleasure of meeting him or watching him play. He was a goalie…my son is a goalie. He was someone’s son…he could have easily been my son. Feeling helpless; What can I do to show my respect? 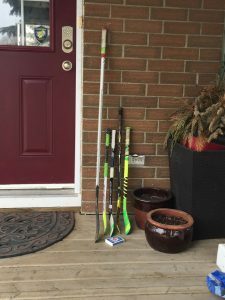 As I fumbled around online trying to blindly make sense of this tragedy on Monday night, I began seeing pictures of people leaving hockey sticks on their front porch so the angels could play the game. It was breathtaking to see. What would I leave out for them? Four mini-sticks and a pack of playing cards of course…it just seemed fitting to me as they were honestly still just kids…and every kid loves to play mini-sticks. In the morning my son decided to place one of his extra sticks on the step. He had a smile from ear to ear as he left for school. He told me he was excited to walk to school and look at all the sticks placed out. He too seemed to find some healing in that gesture. I left for work shortly after and was overwhelmed by what I saw…the number of sticks left out was both heart warming and heart wrenching all at the same time. I cried as I drove…I cried a lot in fact. Nobody has hit me as I skate through all of this with my head down, but figuratively speaking, my heart and soul feel like they took a slap shot to the ankle…not once, but 29 times in an 11-0 pre-season loss. It just makes no sense at all. What do I take away from all this sadness, sorrow and pain? What is the lesson I can take from all of this tragedy? How can I continue to honour the lives lost that night on a lonely rural road? From now on, when I see someone with their head down…I will line them up, keep my elbows down and hit them with a good clean hug, because let’s be honest, it just feels better that way.